Here’s an interview with one of the international student winners of a sponsorship to visit CARP Los Angeles. 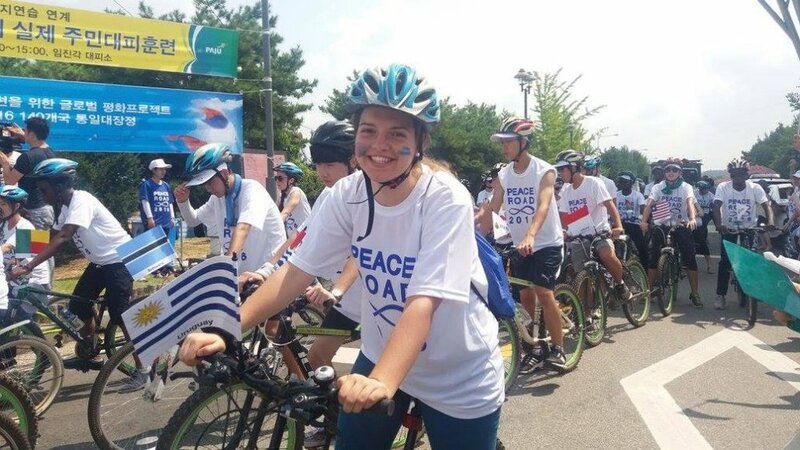 In July 2016, there was a ‘Global Top Gun Youth’ workshop organized in Korea where youth from 63 nations gathered for leadership training and education. At this workshop, FFWPU Continental Director for North America, Dr. Kim, offered to sponsor two international students to visit one of the CARP centers in America in an effort to promote cultural exchange. After an application and selection process, two final candidates were chosen from Uruguay and the Philippines. Here is a little bit about the finalist from CARP Uruguay. My name is Carina Mendez and I am 19 years old. I’m currently studying Communications at the Uruguay National University. My father is Uruguayan and my mother is Brazilian. I have one younger brother currently enrolled in a one-year fundraising and outreach program in Argentina. Me (middle), my brother (right of me), and other 2nd generation at Militar High School Festival. Why did you decide to be a part of CARP? Once I entered college, it was natural for me to become engaged with CARP. I felt like it was the right place and time for me to make a contribution by being a part of this organization. I want to help in the realization of God’s dream and change other people’s lives with the Divine Principle. I want everyone to feel the culture of heart in CARP. What is the most memorable activity that you did with CARP and why? What did you learn from it? Last July, I prepared a youth seminar for middle and high school students. It was so difficult for me to take care of everything alone. I really felt that I needed to grow and develop more in order for me to become better equipped to take on this responsibility. That is why I decided to go to the ‘Global Top Gun Youth’ workshop in Korea. Me on the Peace Road in Korea where I had the pleasure of representing my country. With that in mind, at the next middle and high school workshop in December, I worked together with the CARP team in Uruguay. They helped me a lot with everything. This workshop helped to bring us closer together as a team. So much so that we ended up preparing another seminar together where we did the lectures and everything. Through this experience, I learned that CARP has a lot to offer and that in order to accomplish something big, we have to work together. I learned that if you work as a team, everything is lighter and more fun. Have you ever been on an exchange program? If yes, where and what did you do? I went to the Global Top Gun workshop in Korea in 2016. And I also went to Kodiak, Alaska for the National Ocean Challenge Program in 2015. Then, I also did a one-year fundraising and outreach program in Argentina. My father and I participating in the Ocean Challenge program in Kodiak, Alaska. Do you think it is valuable for students to do an exchange program? What did you gain from the exchange? I think to have an open mind we absolutely need exchange programs. You can always learn from other countries and their experiences in the providence. From my experience with exchange programs, I was able to learn new ideas and different ways to do the same thing. Thanks to that, I could change and try new things in my own country. That is good because when you spend a lot of time doing the same thing in the same way, you eventually end up uninspired and bored. But when you go out and see different realities, you can get new inspiration to change your own reality. What are you most looking forward to on this trip to CARP Los Angeles? I want to see what a CARP chapter in America is like and how it functions. It will be good to learn from our older brothers and sisters who have more experience than us. But the thing I most want is to find a spiritual child in America. I will do my best for that! And finally, I have to admit my enthusiasm in going to Los Angeles is also because that’s where every Hollywood movie begins. That is a dream to me! What do you hope to gain and bring back to your own local CARP chapter? I really hope to be able to gain the tools that will allow CARP Uruguay to develop more quickly. Through this experience, I hope to bring back with me some new ideas and ways to work more efficiently and effectively.